Ed Coleman just reported on WFAN that Mike Pelfrey may make his major league debut for the Mets on Thursday against the Mets. Jose Lima has been designated for assignment, and Pelfrey is on schedule to take his next spot in the rotation. This would make for a wild decision for me to make on Thursday, because Mike and The Mad Dog will be doing the broadcast on the radio side, but watching the game on TV will give us our first look at the phenom. Even though I was initially annoyed I had to listen to the radio broadcast on Gameday Audio to catch the game, I quickly enjoyed having McCarthy and Howie Rose as my companions for this classic of a Mets game. I loved that Billy Wagner chose this game to be his most dominant of the season so far, especially when the "other" Sandman was tagged with the loss. Last season I paid 5 bucks a game to watch a bunch of Pedro Martinez's starts on MLB.com. With the the Mets broadcast on Channel 11 tonight, and the Yankees broadcast on Channel 9, I don't have access to either one on DirecTV. I figured I could buy tonight's game on MLB.com, but they no longer offer one game at a time for purchase. You have to pay 15 bucks for a month's worth of games at minimum. And I guarantee tomorrow and Sunday's games will be blacked out on MLB.com because they are on the FOX and ESPN national broadcasts. So I'm listening on Gameday Audio instead. Melvin Mora signed a three-year $25 million contract extension with the Baltimore Orioles today, keeping Mora with the O's through the 2009 season. I'm a bit disappointed with this, as I thought Mora could play 2nd base or outfield next year for the Mets. The Mets record is 24-16, second-best in the National League. The Mets are in FIRST PLACE, two games up over the Phillies, and three-and-a-half over Atlanta. Despite the pitching dilemma, the Mets have the 4th-best ERA in baseball, and opposing batters have the lowest batting average against Mets pitching than any other team. Tonight's pitcher, Jeremi Gonzalez, has a lifetime record against the Yankees of 1-2 with a 4.30 ERA . The Yankees have Randy Johnson starting tonight against the Mets. In the last three seasons, Randy Johnson has gone 3-2 with a 2.32 ERA against the Mets. In Johnson's last four starts this year he's allowed 22 runs - 17 earned - in just 21 1/3 innings. Since I don't get WPIX (Channel 11) down here in North Carolina, I'll have to watch the game on the YES Network. Hopefully I can stomach the announcers - I may have to listen on the computer instead. Right after Chavez grounds out to end the game, I look up and I see French Francoeor make the catch for the final out in the Braves 9-1 win over the Fish. Frenchy has the Tom Cruise grin while he looks over at the fans while he runs back to the dugout. I think that puts the Braves what, 3 games back now? By next week the Mets will be in 3rd place. Nevermind Lima Time, they have the worst situational hitting ever. I think they put a lot of pressure on themselves to win it all this year, and they are choking against any decent teams already. This road trip was a test, and they failed it, big time. I can't disagree, unfortunately. Before the Mets started the trip, I said the next 15 games would tell us what these Mets are made of. Judging on record alone, so far, not so good. Mutts vs. Junkees starts tomorrow night. There's been a lot of comparison to this club and the 1986 squad. Perhaps this team is really more like 1985? Remember, everyone on the club believed they "should have" won in '85, but ultimately they came up short. It's a long season, and You Gotta Believe!, but these games were a real test, like Tubby said, and as a Mets fan you can't have a good feeling right now. Matt Cerrone is reporting that Brian Bannister re-injured his hamstring in a start for AAA Norfolk this afternoon. What a mess. Honestly some heat needs to go to Omar Minaya, who assembled a pitching staff without a lot of depth. I know that the injuries have been a little more than could be expected, but with Pedro and Glavine at the front end, there should have been more insurance policies in place for injuries. I just can't take more starts by Jose Lima. I just can't take it. Transplanted Ex-Met Jason Isringhausen notched a two-out save tonight against his old club, striking out David Wright and inducing a ground out from Cliff Floyd with the bases loaded to close out Mark Mulder's win. What can you say about this game? Even though the Mets lost, there's not a lot to complain about. Trachsel pitched very well, allowing just 1 run on 4 hits over seven innings, but not as well as Mulder, who got his 5th win on the year. This wasn't a rookie or a wash-up shutting down the Mets, it was a damn good pitcher and there's no shame in that. Albert Pujols was neutralized for the night, and we got beat by Scott Rolen. The worst part of the game was Cliff Floyd going 0 for 4, but we'll find out tomorrow if it's a continuation of his season-long slump, or just a brief interruption of his resurgence. It's Lima Time tomorrow (oh please oh please let that be the last time I write that), in the rubber game against the Cardinals, facing Jason Marquis (4-4, 5.33 ERA). Scoreboard Watch: Atlanta and Philadelphia each were losing their respective games in the 9th inning, but both teams managed to rally against the ballclubs they were opposing. Philly scored 3 runs in the top of the ninth to tie the game 7-7 against Milwaukee, while Atlanta scored a run on a Chipper Jones groundout in the bottom of the ninth to send their game against Florida into extra innings, tied 3-3. In Milwaukee, Geoff Jenkins drove in Jeff Cirillo in the bottom of the ninth to win the game 8-7 over Philadelphia. The Mets two game lead is preserved. Over in Atlanta, however, Larry Jones hit a three-run homer in the 11th to give teh Braves a 6-4 lead over Florida. Florida had scored a run in the top of the inning with a run scoring single by Treanor. On Monday night I went to a Greensboro Grasshoppers game. The Grasshoppers are the A-ball affiliate of the Florida Marlins, playing in the same league as the Mets' affiliate Hagerstown Suns. Starting for the 'hoppers on Monday was left-handed pitcher Sean West. 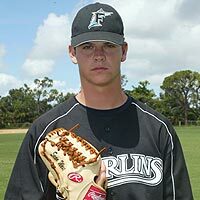 West was the Marlins' sandwich pick in the 2005 draft, picked #44 overall, 39 picks behind Mike Pelfrey. As a left-handed power pitcher, West reminded me of Scott Kazmir because if West had been drafted by the Mets, everyone in New York would know his name and every Mets fan would be counting down the days until he made a big-league start, and crying for Omar's head for being too damned patient with him. This West kid, however, is fortunate in that even though he didn't get the fat signing bonus that Pelfrey did, is able to develop quietly in the Marlins system, without all the pressure of living up to the lofty expectations of New York. He doesn't have to become the next Doc Gooden; he has the luxury of becoming whatever kind of pitcher he is destined to become. Sean West pitched excellent in his start on Monday, allowing just one hit in five innings and got the win for Greensboro. He has posted an 0.64 ERA over his two starts this season. If he were in the Mets system, this start would have made the Daily News, just like Mike Pelfrey's last start did. For details on West's start, you have to peruse the box scores on ESPN.com's minor league pages, or look on rotowire to learn that West is 6 foot 8, from Shreveport Louisiana, and "has a low 90's fastball, but is still refining his curveball and changeup," For anything more, you'll have to read an article in The Shreveport Times for a story about him anticipating Draft Day last summer. For now, if you want to find out about West, you'll have to come down to Greensboro. They do have a beautiful park! I am also hereby calling a self-imposed moratoriam on the dreaded "K" name on this blog. I will not invoke his name. By noting that Zambrano and Fortunato, the two pitchers he was traded away for, both went under the knife for Tommy John surgery this week, I am considering my comments officially complete. No more will I whisper or write his name. Unless he is picked for the AL All-Star team. David Lennon rubs salt in our pitching wounds by pointing out that last night Scott Kazmir beat the White Sox, allowing five hits and one run over seven inningsstriking out eight, and now is 6-2 with a 2.73 ERA on the season (same record as Tom Glavine). Thanks Dave. As an antidote for the salt, I'd like to point out that Todd Pratt went 0 for 3 in Atlanta's win over Florida, while Mike Jacobs went 0 for 5 in the same game for the Marlins. ...please look at the positive that came from that deal. The Wilpon's got Omar to be the GM and now we have Pedro / Beltran / Delgado /and Wagner. Do you really think any of this would have happened if not for the fallout from the Kazmir deal? I love this! Someone called into WFAN this morning with the same comment. Although, at face value, this may be the worst trade ever made by the Mets, it actually may the reason we're enjoying a renaissance now! My jubilation at the Mets tenacity, scoring in the 7th inning to recapture the lead they had blown, was put on hold as the umpires called for a rain delay heading to the bottom of the seventh. The Mets got screwed out of a chance to win in Philly last week due to a rain shortened game, and now they were going to have to sit through a rain delay. This time, however, with the Mets in front on the road and the inning not completed, they at least knew they would get a chance to close out the win, at some point. I changed the channel to the YES network just in time to see Posada win the Yankees game. How is it that the Yankees lose Giambi, Sheffield, and Matsui to injuries and still manage to score 14 runs? Meanwhile, the Mets lose Zambrano and Brian Bannister, and start to stutter? Outrageous. Well, I didn't stay awake long enough to see it, but after an hour-and-40-minute rain delay, the game was resumed, the Cardinals did not score, the Mets scored four more in the eighth, and the Mets won, 8-3 over St. Louis. Cliff Floyd went 2 for 4, hopefully breaking out of his slump, and Glavine got the win while passing Sandy Koufax for 36th on the all-time strikeout list at 2,397. Koufax did it in 2,324 innings, Tom has pitched 4,011. Even better was that the Phillies finally lost a game, and the Mets now have a two game lead. Tom Glavine hit the first batter he faced in tonights game (David Eckstein). Luckily Tim Tschida isn't the home plate umpire tonight, or else he might have thrown Tom out of the game. Matt Cerrone said recently it's not yet time to p-a-n-i-c, but I am quite nervous over here. I'm wondering why, even though the Mets have off days three Mondays in a row, why the 4 and 5 guys still get starts every turn through the rotation? Tonight Tom Glavine faces the Cardinals, which in my mind is a must-win, for the simple reason that the next three games are started by Tom Glavine and Jose Lima (against the Cards) and Jeremi Gonzalez (against the Yankees). I'm absolutely disgusted with the Mets for losing two out of three to the Brewers in the way they did. They could have just as easily been swept, even though all three games were winnable. I'm so angry I haven't even been able to bring myself to the computer to vent my frustation at this blog. I am just stunned at how the Mets have managed to squander the healthy lead they had built. It's just a travesty. Tomorrow I will be back at this blog full force, but for now I am still too damn angry. I even went down to downtown Greensboro to take in a Grasshoppers game, to try and get a positive baseball experience in. The 'hoppers starter was a young hard-throwing lefty. Even though the Grasshoppers play in low-A, the way things are going I wouldn't be surprised if this kid isn't pitching for the Marlins in August, probably beating the Mets.